As Errol Spence 24-0 (21 KO’s) progresses further into his career, the more it resembles a similar path once traveled by the legendary middleweight champion Marvelous Marvin Hagler 62-3-2 (52 KO’s). Are far as listing similarities and drawing comparisons, there are plenty. Comparatively from a fight stylistic standpoint, both are southpaws (albeit Hagler converted and was known as a switch hitter; a fighter skilled to switch interchangeably between southpaw to orthodox stance). Hagler and Spence operate offensively off their stiff right jab; Hagler displayed the ability to effortlessly switch stances as mentioned earlier, but like Hagler, Spence prefers to mount his attack utilizing highly lethal, effective jabs. Both possess impressive, Adonis-like physiques and oddly enough, both traveled to The United Kingdom to capture their first championship title. Hagler made minced-meat out of Alan Minter over the course of four vicious rounds, while Spence comprehensibly violated Kell Brook into submission over the course of eleven rounds. Spence was 27-years-old at the time while Hagler was a year younger aged 26 years-old. Like Hagler, Spence aims to transcend into boxing super stardom by facing another highly coveted, pound-for-pound fighter moving up in weight. For Hagler, his dancing partner thrusting him into the realm of super-stardom was Roberto Duran. Duran, initially dominating the lightweight division with hands of stone, climbed through the welterweight division, eventually reaching the mantle at middleweight to battle Hagler for middleweight supremacy. Hagler soundly defeated Duran in an entertaining, competitive affair, securing his spot as one of boxing best fighters and biggest attractions. Hagler’s victory over Duran led to greener pastures, as his star shined brighter and he capitalized eventually securing fights against Tommy Hearns and Sugar Ray Leonard. Mikey Garcia 39-0 (30 KO’s) is to Errol Spence as Duran was to Hagler. And again, this is not a direct comparison of styles for each fighter, although we can draw similar comparisons for each fighter listed in this formula. Whether it’s the traits of timing, mastery of range and distance, overall toughness and business-like demeanor, this is more of a comparison of situations and possible trajectory. If not no. 1 on any given pound-for-pound list, Garcia is certainly in the discussion – just as Duran in his heyday. Garcia has five world titles across four weight classes in seven championship fights. Like Duran, Garcia aims to move up in weight for greater challenges. “There’s no one else that excites me enough, that motivates me and that can challenge me other than Errol Spence, and I’m willing to take that challenge, all the way up, because that’s the fight that will motivate me the most,” said Garcia at the post-fight press conference in his win over Robert Easter. The emerging Spence recognizes too, facing Garcia could help build his brand among Hispanic boxing fans who strongly support Garcia. It’s certainly a page borrowed from another boxing great and mentor figure to Spence, Floyd Mayweather. Mayweather offered his perspective regarding the potential match-up between Garcia and Spence to Fight Hype. “You have to respect Mikey Garcia for wanting to test his skills against the best guys out there,” stated Mayweather. Aside from Garcia, Spence has other lucrative options on the horizon – his potential Tommy Hearns and Sugar Ray Leonard. Spence can potentially face the winner of Danny Garcia 34-1 (20 KO’s) and Shawn Porter 28-2-1 (17 KO’s) as they finally meet in September. Amir Khan 32-4 (20 KO’s) is still a name in the welterweight division and of course there is the ever-elusive Keith Thurman 28-0 (22 KO’s). The former unified WBC and WBA welterweight champion is still recovering from injury and aims to return at some point in 2018. A meeting between Spence and Thurman may not take place until 2019 if at all, while another emerging combatant apparently usurped Thurman as far as desired match-ups amongst boxing fans. The fighter Spence appears fated to face, also drawing comparisons to the legendary Marvelous Marvin Hagler for his switch hitter abilities, overall grit and menacing demeanor, is none other than Terence Crawford 33-0 (24 KO’s). Crawford is a six-time world champion across three weight classes and like Spence, aims to unify the welterweight division as he did at junior welterweight last year. Anticipation amongst fans, media and other fighter’s alike continues to build in hopes of witnessing these two prized pugilists meet up in what envisions to be a showdown of epic proportions. Will Crawford rival Spence as Leonard rivaled Hagler back in the 1970’s and 1980’s? While that particular plot is yet to be determined, it’ll be interesting watching how the path of Errol Spence continues to unfold. “I wanna be considered as an all-time great,” says Spence, in reference to his goals as a professional fighter. Like Hagler and other phenomenal fighters of yesteryear, Spence is treading along the same path previously molded before him. Philadelphia was a hot bed for boxing back in the 1970’s especially in the middleweight division. Out of own boxers would come in to test the water. Two of them that were schooled in Philly that went onto become world champions were “Marvelous” Marvin Hagler and Eddie Mustapha Muhammad aka then Eddie Gregory. Let’s start with Hagler, who was 25-0-1, when he came to the city of “Brotherly Shove” at the Spectrum on March 13, 1976, losing a somewhat disputed majority decision to Bobby “Boogaloo” Watts, 27-3-1. All of Hagler’s Philly fights were promoted by J Russell Peltz’s Peltz Boxing. Several months late on March 9, 1976 Hagler returned to fight a “different” Willie “The Worm” Monroe, 31-3-1, who was then being trained by future IBHOF trainer George Benton for his second fight. Monroe was no longer a runner but stood in front of you like Benton did as a boxer slipping and countering. This writer was in attendance that night and it looked like by the second round Hagler’s nose reminded me if memory serves me right like “Rudolph the Red Nose Reindeer”. Whether it was broken or not I do not know. In September 14, 1976, Hagler returned to Philly to face their knockout artists Eugene “Cyclone” Hart, 30-6-1 with 28 knockouts. Hagler was ahead on all three scorecards when Hart was stopped in the eighth round. This writer remembers seeing Monroe at a weigh-in with a cast on his I believe left hand sitting there. I asked “I hear you are having a rematch with Hagler in Boston” how come? “I beat him before didn’t I?” Well, like that old saying “watch what you ask for” and Monroe was stopped in the twelfth and final round for the vacant North American title. Later that year on August 23rd Hagler and Monroe would have their rubber match back at Philly’s Spectrum with Hagler stopping Monroe in the second round. Almost a year to the day on August 24, 1978, Hagler returned to face “Bad” Bennie Briscoe, 60-16-5, with 50 knockouts. I recall after defeating Briscoe Hagler went onto comment on how tough Briscoe was. It would be a little over two years when Hagler got his first title fight ending in a disputed draw against Vito Antuofermo, 45-3-1, in Las Vegas. A fight he should have gotten the decision. Antuofermo would lose his title in his next back to back fights with Alan Minter. While Minter and Antuofermo were fighting one another Hagler got a rematch with Watts in Portland, Oregon, stopping Watts in the second round in April of 1980. Two fights later on September 27, 1980, Hagler traveled to the Wembly Stadium, in the UK, to stop Minter on facial cuts in the third round with a riot following the fight. In Hagler’s second title fight he stopped Antuofermo in June of 1981. Two years after that he stopped “Caveman” Lee from Philly who was a member of the Kronk Team in the first round. Now, let’s take a look at Eddie Mustafa Muhammad, 6-0, when he made his Philly debut on September 24, 1973 scoring a first round knockout over Philly’s Elwood Townsend, 3-6-2. J Russell Peltz told this writer he promoted the Townsend, Smith and Briscoe fights that Mustafa had in Philly. Almost a year later on August 26, 1974, in New York, he knocked out Hart in 4 rounds. On January 14, 1975, Mustafa returned to the Spectrum knocking out Philly’s Steven Smith, 15-4, in 4 rounds. On April 28 he returned to the Philly Arena knocking out Don Cobbs, 25-12-1, of St. Louis. On June 16th he stopped Lenny Harden, 14-4, from nearby Philly suburb of Coatesville. On August 18, 1975, Muhammad took on Briscoe, 51-14-2, at the Spectrum losing by split decision. On July 14, 1976, he returned to Philly’s Convention Hall to stop Lee Barber, 9-3-1, of Detroit in the fourth round. On March 11, of 1977 Muhammad would take on Philly’s Matthew Saad Muhammad, 13-2-2, at the Philly Arena to take a split decision win. Later that year on November 20th he would get a title fight losing a disputed decision to Victor Galindez, 47-6-4, for his WBA Light Heavyweight title in Italy. He got knocked down in the fifth round which seemed to make the difference in the scoring losing by a point on two cards and by two points on the other. Galindez would lose his title less than a year later to Philly trained Mike “The Jewish Bomber” Rossman from Turnersville, NJ. Muhammad would go onto win thirteen of his next fourteen fights only losing to James Scott at the Rahway State Prison. On March 31, 1980, he would win the WBA Light Heavyweight title stopping Marvin Johnson. His first defense was against Philly’s Jerry “The Bull” Martin, 19-1, who he stopped in the tenth round. After Muhammad lost his title to Olympic Gold Medalist Michael Spinks in July of 1981 he would return to Philly one more time defeating Pablo Paul Ramos, 20-3-1, at the Spectrum. In my old man’s gym hangs a framed picture of Marvin “Marvelous” Hagler with the black and blue trunks, the trunks he wore in the fight against Sugar Ray Leonard 30 years ago. The result of the fight is often discussed between my parents. Pops was ride-or-die with Hagler and my mom loved her some “Sugar” Ray Leonard, so they could never come to an agreement on who won the fight. My Pops is from Rhode Island and always felt like Hagler was kin. My mother watched Leonard’s fights on TV before cable television monopolized the sport. “The Green Hill boxing gym” opened in 2001. 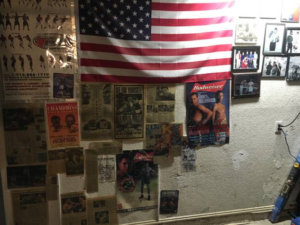 My pops called this part of the room the “wall of fame.” On the right is a framed picture of “Marvelous” Marvin Hagler and “Sugar” Ray Leonard. My parents met in the Army and boxing is likely what drew them together. While serving in the military, my old man was an amateur boxer. Hagler, also a New Englander by way of Brockton, Massachusetts had this no nonsense image about him. In the build up to the Leonard fight, he wore a hat at a news conference with the word “WAR” embolden above the brim. I think that’s what my old man liked about Hagler the most. Hagler disregarded his opponents. Like Hagler, my pops grew up poor. My old man saw Hagler as someone who made it out. More so than the power, skills and savagery that Hagler possessed, was the every-man feel that my pops and other fans admired. Hagler came in each fight like therew was a repressed memory of a bully, and that bully did something awful to Hagler in his childhood and now he’s looking to take it out on whatever man is in front of him. This is the behavior I sense from him but I had to watch Hagler-Leonard for myself again, by myself. Hagler’s approach to most of of his fights was to remain mean. From the training camps and promotions, all the way through fight night, Hagler’s demeanor was bully-like. It was cartoonish, like the X-Men’s Wolverine or Dragon Ball Z’s Vegeta. Columnist Michael Katz wrote about how Hagler skipped seeing his wife and new-born baby daughter because it would make him too soft before his fight with William “Caveman” Lee. Anger can be a valuable psychological weapon in the ring but in this fight against Leonard, it held him back. Hagler started the fight in a conventional stance even though it was known that Leonard struggled with southpaws. Hagler chased him all fight long and Sugar Ray’s clinch’s frustrated Hagler. He made Hagler badly miss what seemed like easy set ups for power punches, and he outworked Hagler by using his legs and speed and working the ring. While Hagler muscled his way through Leonard’s flurries, Sugar Ray never panicked. His legs were tired but still battled and got off flurries and quick combinations on the stoic Hagler. I scored the fight 115-114 for Leonard. Sorry pops, but you can’t win this one. Mom was right. In all honesty, I’m surprised the fight is still such a big deal. As the media of the time pointed out, it wasn’t the most thrilling affair. What’s more, the bout occurred just before the zenith of the Mike Tyson era. 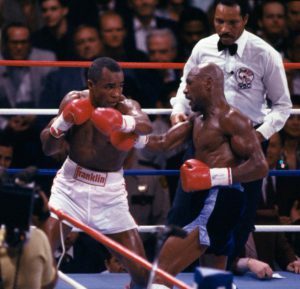 And while it’s true Marvelous Marvin Hagler and Sugar Ray Leonard were the two biggest names in boxing at the time, the magnificent age of pugilism they represented was clearly on the way out when the two men finally met in the ring on April 6th, 1987. Upon some retrospection, however, it makes sense that the Hagler-Leonard middleweight championship fight remains alive and well in the public consciousness to this day. For those who don’t know, Sugar Ray Leonard was the darling of the boxing world, if not the entire sports world, from the late seventies, through the early eighties. A former Olympian with a winning smile and a skill set to burn, the man epitomized what it meant to be an all American success story. After winning the welterweight title back from the meanspirited Roberto Duran in classic stand up to the bully fashion, Leonard said he was happy to win the championship for America. He meant it. And in an era where patriotism wasn’t confused with xenophobia, that sort of thing meant something to the public. Leonard’s polar opposite was Marvelous Marvin Hagler. The word Marvelous was actually part of his legal name. He put it in there himself (apparently Marvin Hagler simply wouldn’t do). A gritty product of Brockton, Massachusetts (which gave him a kinship with one Rocky Marciano) Hagler had to come up the hard way, through grueling affair after grueling affair. When the man finally won the middleweight title strap, the British audience who witnessed the fight live and in person tossed bottles into the ring. But Hagler wasn’t to be denied. He wasn’t showered with accolades, he earned them. Yet it wasn’t until Hagler actually bested a rejuvenated Duran in a fifteen round war that attention was finally paid. And, after beating former Leonard nemesis and all time legend Tommy Hearns in what is still the greatest single sporting event I’ve ever seen, it was Hagler, not Leonard, who was on top of the boxing world. Where was Leonard? Well, eye problems had taken him out of the sport – at least for a while. For it’s said that after Leonard watched Hagler struggle against the valiant John Mugabi a year after the epic Hagler-Hearns bout, Leonard realized he could beat the man. And beat Hagler Leonard did, in one of the biggest upsets in the history of boxing and also of sports in general. Yet that’s not why the fight is still such a hot topic all these years later. There’s a lot more to the story than just that. For many people feel Hagler got robbed that night, that the 12 round decision victory went to the wrong man. Yet that’s still not why the fight is such a hot topic in 2017. The real reason Hagler-Leonard resonates as it does three decades later is because a golden child bested a working class Joe in a way many found to be unfair. And that sort of thing can hit home. Had Leonard knocked Hagler out, the bout would remain a classic – but it wouldn’t be seen as the giant enigma it remains to this day. Look at it this way: If Hagler had been awarded the decision that night instead of Leonard, the fight would still have been controversial, but it wouldn’t have irked as many people as it does now. The fact that the match consisted of Hagler chasing Leonard around the ring while Leonard fired off quick bursts naturally made it open to interpretation. In a lot of ways, a person’s opinion of the contest could very well be based on his or her preferred style of fighting. Those who like aggression would be inclined to give the nod to Hagler. This is simply one of those cases where a real consensus will most likely never be reached. Hagler retired after the bout, denying Leonard the chance to erase any question marks. In a sense, both Hagler and Leonard will forever be seen as they are in still photos from that night – frozen in time, engaged in combat, equals in all ways, save for individual opinions, the golden child and his blue color nemesis. It wasn’t a great fight, but it was most certainly a memorable one, in large part because many feel it was emblematic of life itself, a thing where the golden child forever emerges victorious, deservedly or not. Friday night sees the long-awaited comeback of“Rowdy” Ronda Rousey following her shocking defeat to Holly Holm last November, in a result infamously described by UFC commentator Joe Rogan as, “the biggest upset in combat sports history”. Prior to her defeat,Rousey had demolished a string of 12 opponentswith only one of them making it out of the first round – a devastating record by any standard, and there’s no doubt that Holm’s knockout was a truly enormous upset, with the challenger overcoming odds of up to 12-1 against her. That being said, it takes two people to make a fight, and the bookies’ published odds are not the only ingredient that goes into a big upset – the wider context of the underdog’s role is also vital. Ronda’s record was indeed formidable, but keen observers had noted that it could be a far more difficult task than anything she had faced before, with Holm being a former world-boxing champion and arguably the first bona fide world-class striker “Rowdy” had faced off against. This is the grand-daddy of upsets: not just the biggest upset in the history of boxing; not even the biggest upset in the history of combat sports. This one is arguably the biggest upset in the history of sports, period. The reason for the scale of Douglas’ shock was twofold: firstly, “Iron” Mike was a destructive force the like of which had rarely, if ever, been witnessed before. Carrying an undefeated 37-fight record, all but four of Tyson’s victims had been knocked out, 17 of them in the first round. Tyson made a habit of making accomplished world-class boxers look like bunny rabbits caught in the headlights of a freight train. Secondly, Tyson’s awesome aura was set against Douglas’ far less-than-fearful persona. A competent yet unspectacular heavyweight, Douglas’ physique was rippled rather than ripped andhis style plodding rather than punishing. Weeks before the contest though, Douglas’ mother had died, providing him with the kind of motivation and discipline he’d previously lacked. Meanwhile Tyson had fallen into the age-old trap of believing his own hype; his preparations consisted largely of hosting Japanese women in his hotel room and he was knocked down in sparring by Greg Page. Even so, a listless Tyson was able to floor the challenger and almost pulled off a knockout victory in the eighth round. Douglas beat the count and continued to pummel the champion with a solid jab and powerful right hand. In the tenth, “Buster” unloaded a vicious combination punctuated by a huge right uppercut that sent Tyson sprawling. As he scrambled to put the gumshield back into his mouth, referee Octavio Meyran waved the finish and signaled the greatest upset in history, as the 42-1 outsider stunned the world. *To his credit, Joe Rogan later admitted that this was actually a bigger upset than Rousey-Holm. It is a testament to Tyson’s fearsome aura and the magnetic grip he held on the public consciousness that six years after the Douglas defeat and following three years of incarceration, he was yet again considered invincible – despite Douglas’ evidence to the contrary. Tyson had demolished four challengers in just eight rounds since his release from prison, though he had yet to face anyone offeringmuch resistance. Frank Bruno looked scared stiff as he walked to the ring and Bruce Seldon put forward probably the meekest capitulation in the history of heavyweight championship boxing, surrendering in just 109 seconds. Evander Holyfield was a different proposition altogether, though few credited him with this distinction at the time. Once again, the monumental scale of Holyfield’s upset was not just a measure of how highly Tyson was regarded – it also came from a foolish under-estimation of what “The Real Deal” had left to offer. A glut in recent performances in the ring, including a KO defeat to arch nemesis Riddick Bowe and a health scare regarding a heart condition had effectively erased memories of Holyfield’s fighting skills and warrior spirit.Many pundits argued that Holyfield was not just going to lose, but that he was in danger of being seriously injured. The former champ opened as a 25-1 underdog, but his ironclad self-belief, granite chin and counter-punching strategy troubled “Iron” Mike from the outset. When Holyfield took Tyson’s vaunted power punches, retained his composure and kept firing back, it soon became evident that “the Baddest Man on the Planet” had no back-up plan. They say a picture tells a thousand words, but when Tyson was lifted off his feet by a left uppercut in the sixth round, far less than that were needed to describe the look on his face. Holyfield proceeded to administer a beat down until a dejected Tyson was finally rescued by referee Mitch Halpern in the eleventh round. Lennox Lewis had been knocked out before, but going into his fight with Hasim Rahman he was in the process of establishing himself as one of the most dominant heavyweight champions in history. He’d already made 12 defences over two reigns as WBC championand was making the fourth defence of the lineal and unified title he won against Evander Holyfield. He had also cut a swathe through potential heirs to the throne, blasting Michael Grant in two rounds and thoroughly outboxing dangerous New Zealander David Tua. Unfortunately, Lewis had also spent time during preparation for his title defense schmoozing on the Hollywood film set of Ocean’s Eleven, while unheralded challenger Hasim “The Rock” Rahman grafted in the intense heat and high-altitude of a South African boxing gym.But while Rahman was a motivated and respectable contender, he’d done little in his career to indicate he posed a serious threat. Indeed, two years prior he had been brutally knocked out by Oleg Maskaev. In the ring though, the difference in each man’s preparation showed, as a complacent Lewis blew heavily and struggled to assert himself. In the early rounds, there were warning signs that Rahman’s overhand right posed danger, but even so the end came suddenly and unexpectedly in the fifth round, as Lewis backed against the ropes and the 20-1 outsider unleashed a haymaker that landed flush on the jaw. The champion crumpled into a heap and minutes later was still in disbelief about what had occurred. To his credit, Lewis returned the favour when properly focused for the immediate rematch, knocking out Rahman in the fourth round to reclaim his title. The 4-1 odds on Ali for this fight really don’t do justice to the monumental scale of the task he overcame on this momentous night. Foreman – much like Tyson years later – was considered to be an unstoppable force that had brutally manhandled some of the most dangerous heavyweights in the world. Joe Frazier, the undefeated heavyweight champion, conqueror of Muhammad Ali and one of the finest fighters the division had ever seen, was bounced around the ring like a rag doll and brutally stopped in two rounds.Ken Norton, a fighter who’d also taken Ali to the wire on two occasions (going 1-1 with The Greatest) was similarly dispatched by Foreman in less than 6 minutes. In contrast, Ali was 10 years removed from his initial title-winning effort against Sonny Liston, had barely squeezed by Norton in their second fight, and looked sluggish in a dull rematch victory over Frazier. A 32-year-old Ali offered his usual, charismatic, confident predictions before the bout, but few took him seriously, and even his own camp appeared to fear the worst. 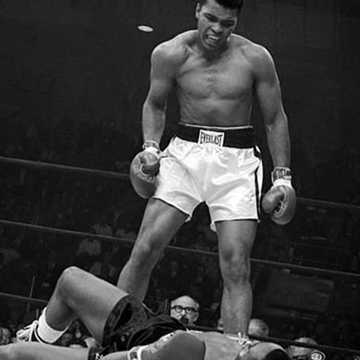 Norman Mailer described the atmosphere in Ali’s dressing room as, “like a corner in a hospital where relatives wait for word of the operation.” The dark mood failed to stop the irrepressible Ali, who boxed one of the most brilliant, bold fights ever witnessed to recapture the Heavyweight Championship and cement in his place in history with a truly unbelievable upset of epic proportions. In 1982 “Sugar” Ray had retired following surgery to repair a detached retina, returning to the ring in 1984 in what should have been a routine victory over Kevin Howard, but announced his retirement again following the fight after suffering his first ever career-knockdown. Now, having only boxed once in five years, Leonard was moving up two weight classes from his favoured welterweight division to take on one of the greatest middleweight champions of all-time. It looked liked Mission Impossible on Viagra. “Marvelous” Marvin Hagler hadn’t lost a boxing match since dropping a majority decision to Bobby Watts over a decade earlier, had won 13 consecutive middleweight title matches, and was ranked as the No.1 pound-for-pound fighter in the world by KOMagazine. It’s therefore a testament to Leonard’s star power that he opened only as a 4-1 underdog, and had even shortened these odds to 3-1 by the time of the fight. 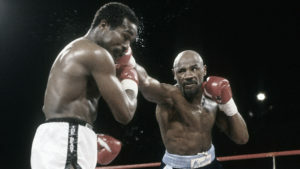 Among the “experts”, few gave the challenger a chance though, with 18 in a poll of 21 writers picking Hagler to prevail. The eventual split decision in Sugar Ray’s favour is still bitterly disputed to this day. While there is a strong argument that Hagler did enough to win, there is no denying the success of Leonard’s psychological games, and the fact that he pulled one of the greatest examples of mind over matter in the history of boxing. Englishman Turpin probably caught the original “Sugar” Ray at the perfect time, as he came to the end of a busy European tour. Still, defeating arguably the greatest pound-for-pound fighter of all time was a stunning achievement. On paper the 8-1 odds were even steeper than when the older version of Clay [Ali] defeated George Foreman, as the Greatest “Shook up the World” for the first time in his amazing career. Chavez was lucky to escape with a draw against Pernell Whitaker four months earlier, but was still officially undefeated after 90 fights, 27 of them for world titles, and he entered the fight as a massive 18-1 favourite. The young, undefeated “Brown Bomber” was widely perceived as unbeatable, but the German had studied his style and exploited his weaknesses to great effect. A more experienced Louis destroyed Schmeling in a single round in their famous rematch two years later. Curry was considered one of the elite fighters in the sport and was being groomed for super-stardom, but he was struggling desperately to make the weight limit. Meanwhile Honeyghan paid short shrift to the champion’s undefeated record and bet $5,000 on himself at odds of 5-1, shocking the bookies and the boxing world in the process. 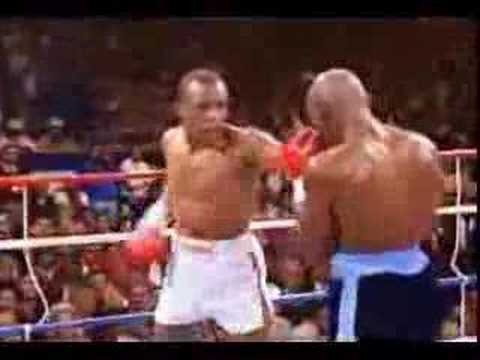 The flow of Ray Leonard’s footwork in the face of a highly disciplined power puncher such as Hagler was the perfect instrument for achieving a dominant performance. What Leonard was able to employ brilliantly was a series of flurries to Hagler’s head all the while gaining quick victorious momentum right from the get go, partially thanks to Hagler’s odd choice of using the orthodox stance for the first two rounds. Leonard did not permit Hagler to engage in a combative boxing match. He refused to stand right in front of Leonard and face his opponent like James Toney. To commit to such a stance in front of someone like Hagler, whose timing and boxer-punching versatility was brilliant when his opponents stood before him, would have been the formula for self-defeat. Even if some may say Leonard didn’t give Hagler a fight, Leonard geared his tactical contemplations towards objective analyses which were not dominated by emotion or pride but towards the end goal in all boxing matches: victory. Julio Cesar Chavez), some psychological advantages may have played in Hagler’s favor for the sake of the late rounds as Hagler threw multiple combinations as he pinned Leonard against the ropes. This was a confrontation between two top-caliber boxer-punchers, but clearly, in such a clash between two masters of the sport, both Leonard and Hagler had to resort to their primary identities as a fighter: boxer and puncher respectively. Just to bring in another boxer-puncher v.s. boxer-puncher match, this contrasts with the bout between Canelo Alvarez against Miguel Cotto. Though both were primarily aggressive brawlers before anything else, both were able to display great versatility in their choice of footwork angles, counter punching opportunities and timing of combinations. How come Hagler could not pull off a versatile performance with Leonard? Because Leonard was just simply the greatest boxer of his generation, whose footwork was unparalleled and the greatest witnessed at that time since perhaps Willie Pep. Leonard was completely comfortable in that ring for a majority of the fight. At one point even, during Round 5, Hagler managed to pressure Leonard to the corner while causing his opponent to momentarily stop his dance around the ring. But Hagler could not capitalize on this opportunity. Hagler threw inaccurately, perhaps psychologically frustrated up to that point by Leonard’s refusal to engage in a brawl while constantly evading him. At that moment in the corner, he also threw multiple southpaw jabs, but Leonard- completely relaxed and confident- was able to dodge them all with his hands down. Hagler was at his finest during the last three rounds, when Hagler began to overwhelm Leonard with a multitude of combinations and successful jabs to Leonard’s head. The constant pressure paid off for that moment, causing for an incredible ending to what had essentially been a dominant chess match forced upon by Leonard. It was at that point that Leonard at last accepted Hagler’s invitation to a brawl. And did Leonard disappoint? After all, Leonard wasn’t just a boxer with fanciful footwork. He had a fighter’s instinct who wished to knock out his opponents with overwhelming speed and aggression. Leonard may have been overwhelmed against the ropes strategically, but he was in no way momentarily caught in an inescapably dangerous situation. He basked in the moment and fought back with equivalent willpower and amazing speed. Even during Hagler’s finest moment, Leonard did not permit him to win any rounds easily. Leonard employed a masterpiece of footwork, timing, speed, reflexes, psychology and ring generalship while simultaneously displaying will and bravado. This was perhaps his greatest performance. On May 7th the lineal Middleweight champion of the world Canelo Alvarez will defend his title against Amir Khan. It is a much anticipated fight against two of the best fighters in the world today. Canelo, who has fought his career in the Jr. Middleweight division of 154 pounds, currently holds the WBC & Ring Magazine titles and looks to defend them at the minimum catch weight of 155 pounds. Amir Khan, the former Jr. Welterweight champion of the world, has never won a title at welterweight or even fought at Jr. Welterweight and is essentially jumping over two divisions to get his shot at Canelo and the lineal middleweight belts. There is no real problem with this attempt. It shows great courage by Khan, taking on a much bigger man, relying on his boxing skills and superior speed to lead him to victory, but we were taken back when Khan compared this fight to one of the greatest rivalries and fights in the sports history. Khan compared the fight to that of Marvelous Marvin Hagler defending his Middleweight title against the great Sugar Ray Leonard. Many problems arise when that statement is made. First it is the comparison that Amir Khan makes between himself and Sugar Ray Leonard. By that time in Leonard’s career he was already a Olympic Gold Medalist, multiple time World Welterweight champion and had beaten the likes of Hall of famers such as Wilfred Benitez (by KO), Roberto Duran (by TKO) and Thomas Hearns (in an epic TKO comeback). Ray Leonard was the best fighter on the planet. Khan has already shown that he has a suspect chin and his most recent win against Chris Algieri proved that he may not be at the elite status that he believes. Ray Leonard and Amir Khan are not the same type of animal. They may have been known for having fast hands, but that’s pretty much where the buck stops. Also, to be fair, Canelo is no Marvin Hagler. Hagler is one of the greatest Middleweight champions of all-time, some say he is the best. Hagler defended his titles from 1979 until his split decision loss to Leonard in 1987. In between those years he went to war with some of the greatest as well, Duran, Hearns, and John Mugabi. Hagler was 33 when he fought Leonard, with 67 fights under his belt. Canelo will be 25 on May 7th. Another enormous difference between the two fights is the animosity between the two opponents. Marvin Hagler loathed Ray Leonard. Hagler always felt he was the better fighter of the two and attempted to fight Leonard for years. Leonard had the pizazz and good looks that put him on the television shows, cover of cereal boxes and adored by the masses. Hagler was always bitter, and was easily made angry by Leonard. The greatest mind game that Leonard ever played on Hagler was in 1984, after Leonard beat Kevin Howard, he held a press conference in Baltimore, Maryland, and he insisted that Hagler and his team fly down for the announcement. Hagler was ecstatic, assuming that he would be announcing a fight between the two, only to arrive and have Leonard retire on the stage. Leonard had played the ultimate trick, something that infuriated Hagler, and when they met 3 years later, would help play right into the hands of Leonard. Hagler wanted nothing more than to batter the smaller fighter. Sugar Ray would use that to his advantage and make the bigger man chase him around for 12 rounds. Canelo and Khan have no bad blood. Neither fighter is at all in the others head. Canelo doesn’t have to think about anything except his game plan. He knows that Khan is fast, but he has been in the ring with Floyd Mayweather Jr. and Khan isn’t close to that kind of level. Canelo has flattened many tough fighters, who fight at the 154(5) lb. limit in every fight. What happens when this smaller fighter, Khan, gets hit on the chin by a true, young, middleweight champion? We’ve seen what smaller fighters like Breidis Prescott and Danny Garcia can do. I doubt those guys would have been able to do that to a guy like Sugar Ray Leonard.